Set in 1952, The Finest Hours recounts the true story of one of the most dangerous Coast Guard rescues in history. When a raging storm splits the SS Pendleton in half off the coast of Massachusetts, the oil tanker only has hours left before it sinks entirely. Led by Ray Sybert (Casey Affleck), the crew works rapidly in order to buy themselves some time aboard the dying vessel. Meanwhile, local Coast Guard crewman Bernie Webber (Chris Pine) braves the open ocean to come to their aid. 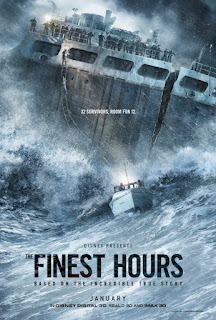 Unfortunately, The Finest Hours was not the finest movie. Its biggest pitfall by far was the drama away from the ocean, which was downright painful to watch. When you go into a movie about seafaring in a deadly storm, the clunky romances and squabbles back on land are just as unexpected as they are unwanted. The main plot was continuously getting bogged down by the cliché courtship between Bernie Webber and his fiancée, as well as multiple mentions of a past failed rescue attempt. The latter was mainly troubling because it made Bernie’s desire for self-redemption begin to eclipse the real goal: Saving the 32 lives aboard the SS Pendleton. The character development throughout the movie felt forced, which was especially surprising given the noteworthy cast. It felt like they were too focused on trying to assert that their characters were ‘real people’, when they should have been focusing on giving engaging performances. However, this is mostly the fault of the director and writers. Overall, the cast seemed to be doing the best they could with what they were given. I hate to typecast, but frankly, Chris Pine’s role felt disingenuous. Having Chris Pine play the awkward, timid skipper was about as weird and uncomfortable as the time Toby McGuire tried to play the confident, alluring villain in Spider-Man 3. You know what scene I’m talking about. Then there was Webber’s fiancée, played by Holliday Grainger, whose character was especially unoriginal. I get what they were going for – the independent woman unfazed by a society run by men – but her character was severely lacking in substance. On a positive note, the visuals did gain back some brownie points. The scene where Josh Stewart’s character is going to talk to the ship’s captain, only to find that half of the tanker is just gone, gave me chills. The tense score by Carter Burwell, combined with the 70-foot CGI waves add up to some very stressful sequences. So, in this aspect, the film did do a good job of expressing the uncooperativeness of nature. But this theme can only carry the movie so far, especially since it seems familiar and overused, particularly with the recent showing of The Revenant. What The Finest Hours came down to was a disjointed mesh of a daring rescue mission and a sappy romance, hastily plastered together with a few recycled motifs. If director Craig Gillespie had stuck to what was happening on the oil tanker, the movie would have been much more captivating. It’s a shame that the incredible story didn’t produce an amazing film, because it definitely deserved it.